The Odena Cast Aluminum 5 Piece Outdoor Dining Set with Square Table by Great Deal Furniture is an attractive, great value dining set that will comfortably seat four adults in its generously-sized armchairs — letting you enjoy and share your outdoor space with family and friends for a spot of outdoor dining, or evening drinks and conversation out on your patio, deck or balcony. Similar to the larger Odena 7 piece dining set, but with a more compact footprint, the Odena Cast Aluminum 5 Piece Outdoor Dining Set with Square Table is the perfect size for small families (or get-togethers with just a few friends), and is ideal for smaller outdoor spaces such as modestly-sized patios, decks or balconies where space is at a premium. 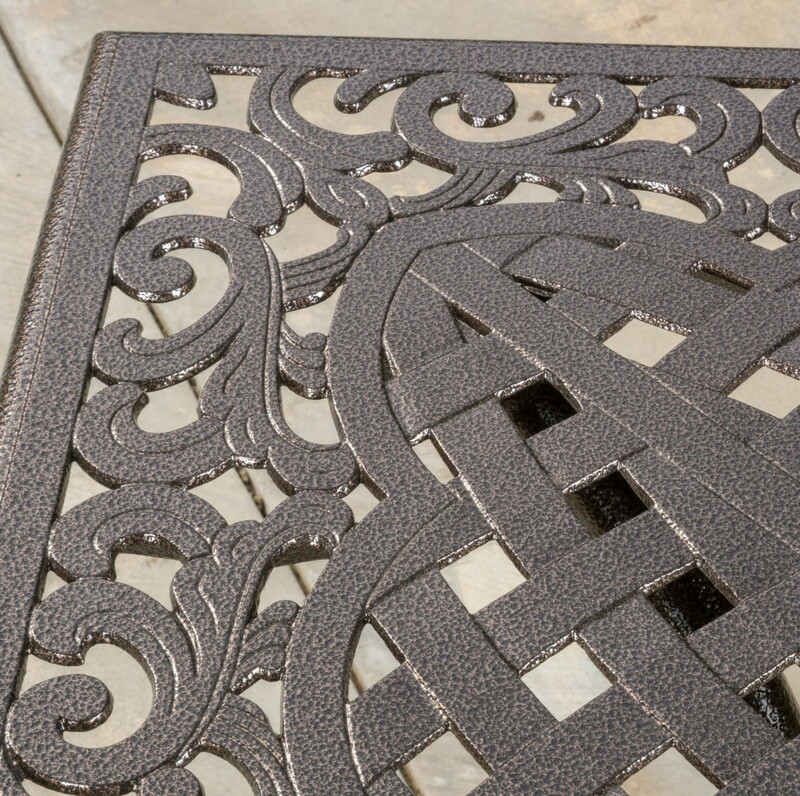 Constructed of strong, durable, weather-resistant cast aluminum, which is completely rust-proof due to its absence of iron, the Odena Cast Aluminum 5 Piece Outdoor Dining Set with Square Table comes in a rich, dark bronze, hammered finish, has a substantial weight to resist winds (yet remains light enough to easily move around), and is designed with durability in mind — for years of enjoyment ahead. 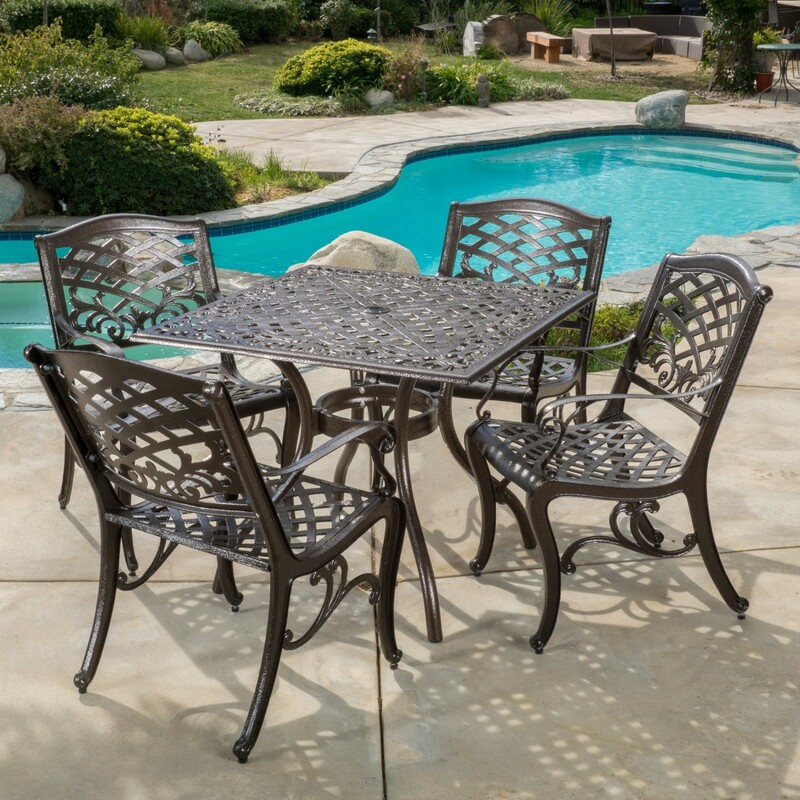 Including a 37-inch square table, and four generously-sized armchairs (each with a seat size of 26.25″ wide by 22.25″ deep), the Odena Cast Aluminum 5 Piece Outdoor Dining Set with Square Table features an elegant, rounded-lattice design on the chair seats and backs, and on the table top — which apart from being attractive, helps reduce water pooling for quicker drying, and more enjoyment. 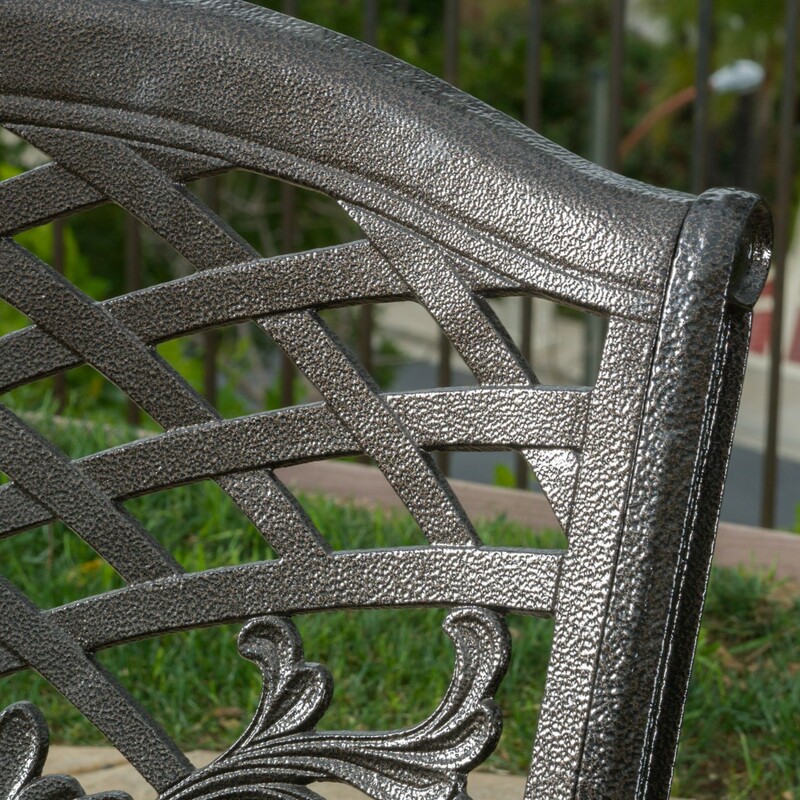 Including adjustable stoppers on each chair leg, which help to protect the surfaces of your patio or deck from scratches, as well as helping to level out the chair legs on uneven surfaces, the Odena Cast Aluminum 5 Piece Outdoor Dining Set with Square Table has lots of nice little touches you and your guests will appreciate, and is sure to bring about many compliments as you share it with friends. Also including an umbrella hole in the center of the table (ready for those very hot summery days), and an umbrella hole cover (for when not in use), the Odena Cast Aluminum 5 Piece Outdoor Dining Set with Square Table is low-maintenance and easy to clean (simply wash with some dish soap as required), and is ready to help you make the most of your outdoor space (whatever the season). With quick and fuss-free assembly (just screw the parts together with the included nuts and bolts), the Odena Cast Aluminum 5 Piece Outdoor Dining Set with Square Table provides quality, style and comfort, all at a great price, includes a 30 day warranty, and is a best seller over at Amazon.com (rated 4.8 out of 5 stars from 133 customer reviews) with FREE shipping. Click to see current price.